FORT RUCKER, Ala. (March 6, 2014) -- Fort Rucker's Soldiers always strive to be high above the best. 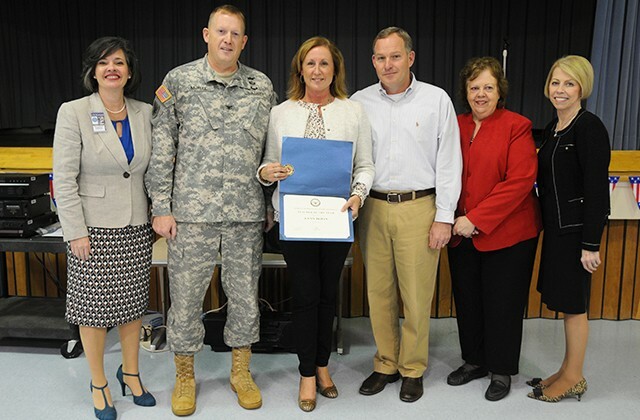 The same goes for its civilian employees, and one such employee soared over the competition last month when she competed for the Department of Defense Education Activity Teacher of the Year. "I put in my best efforts into the audition, but this is a complete surprise. It is over the top," she said. "I am so thrilled and honored." Irwin has been a teacher for 25 years, but has spent the last 12 at Fort Rucker -- the past three being spent with first graders. Irwin serves on numerous committees and teams along with her typical duties as a teacher, but she said the school's supportive environment is a major part of her success for her award. "Thank you for letting me do what I do best. This is honestly the one school where I have seen the most selfless people and the most encouraging people … and I appreciate every one of you," she said. "My husband recently said that I am probably the happiest I've ever been." "It is a great honor to represent this district and the people of this school. I'm thankful to work with a great group of people and a leader who empowers me," said Irwin, who is proud to teach military Families because she is herself an Army spouse. "It is an honor to serve military Families. Being able to understand what the kids go through is special to me, and I enjoy knowing I can contribute and be helpful." "I recorded myself during the interview, that way I could listen to it afterwards because I wanted to see how rotten I might have sounded. But after forcing my husband to listen to it, he told me in no way did I bomb," she said. "That made me feel much better." Col. Stuart J. McRae, garrison commander, said during the ceremony that he was impressed with not only Irwin's accomplishment, but everything the school has done in the past few years. "I know that (Irwin) represents all the fantastic teachers that we have at both the primary and elementary schools," he said. "I am convinced that our Fort Rucker star will continue to shine."